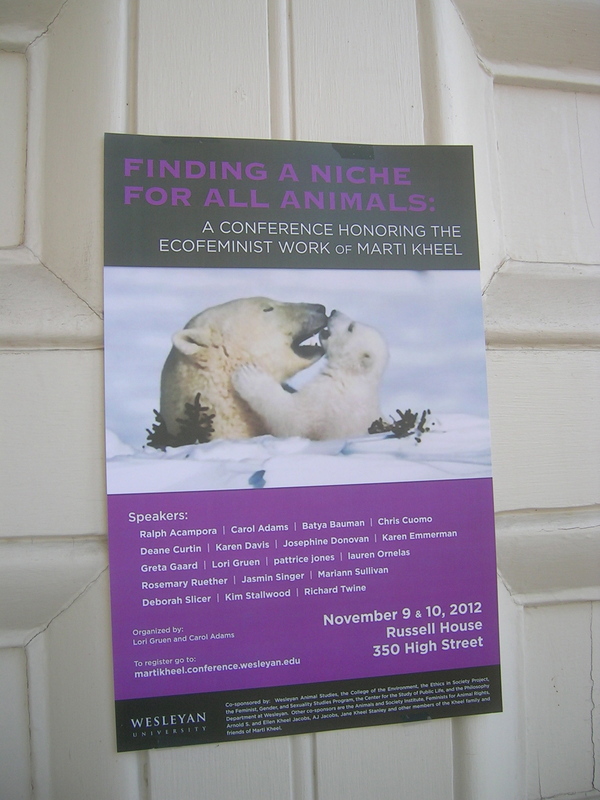 This weekend, I attended a conference honoring the life and work of late vegan ecofeminist scholar and activist Marti Kheel. 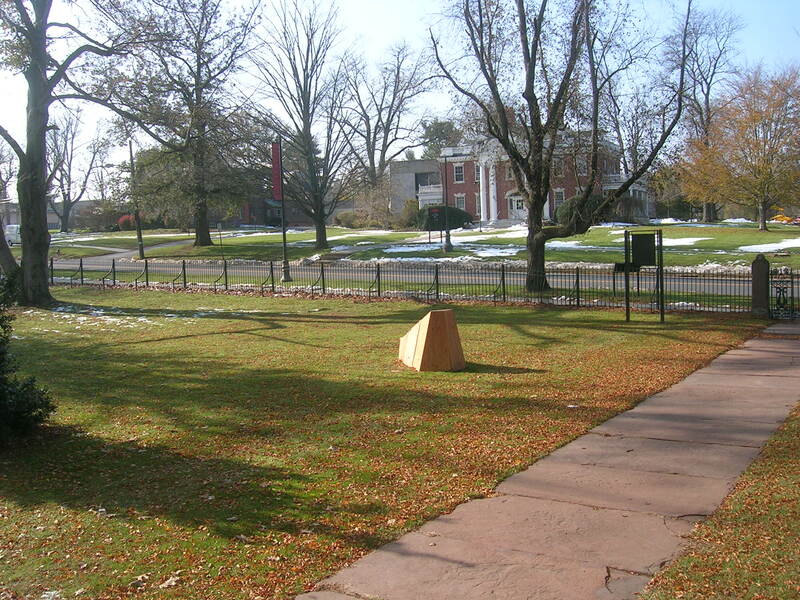 The conference took place at Wesleyan University in Connecticut, and was organized by Wesleyan professor Lori Gruen and one of my personal heroines, Carol J. Adams. 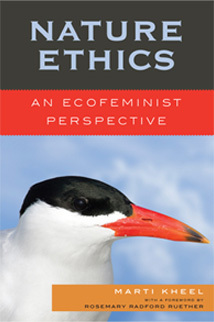 Marti was the author of the classic ecofeminist book Nature Ethics: An Ecofeminist Perspective, which, according to Marti, “seeks to heal the divisions between the seemingly disparate movements and philosophies of feminism, animal advocacy, environmental ethics, and holistic health.” What drew me to Kheel’s work as an undergraduate at Vassar is that it outlines an ecofeminist philosophy that acknowledges the crucial roles of empathy in activism. It has always made intuitive sense to me to apply my “feeling” self to my activism. 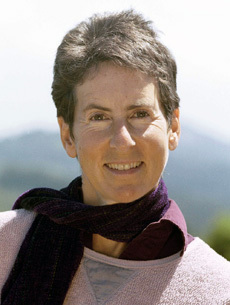 The late ecofeminist vegan Marti Kheel. I love how Marti explained that killing animals is wrong on “logical” grounds, but that we can also argue that one’s feelings about animals, compassion for their lives, and empathy for others’ suffering are valid reasons to be in favor of a plant-based diet. Marti was a fantastic, determined, strong-minded activist, and a cherished friend to many within this movement and beyond. It was inspiring to see the ripples of her influence through the words of many of her friends and colleagues who spoke at the memorial the first evening of the conference. 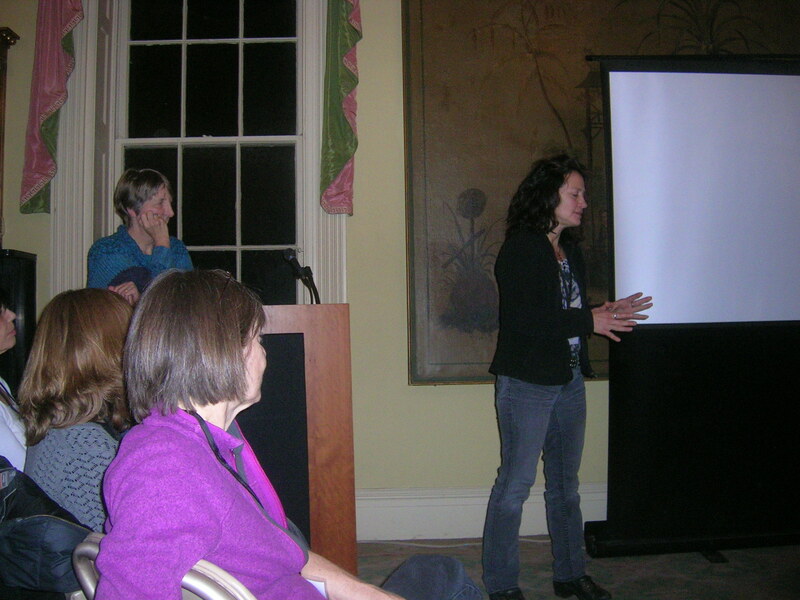 After a documentary shown about her life and work and a wonderful speech by Marti’s friend and colleague, The Sexual Politics of Meat author Carol J. Adams, other folks stood up and spoke about their personal connections to Marti. 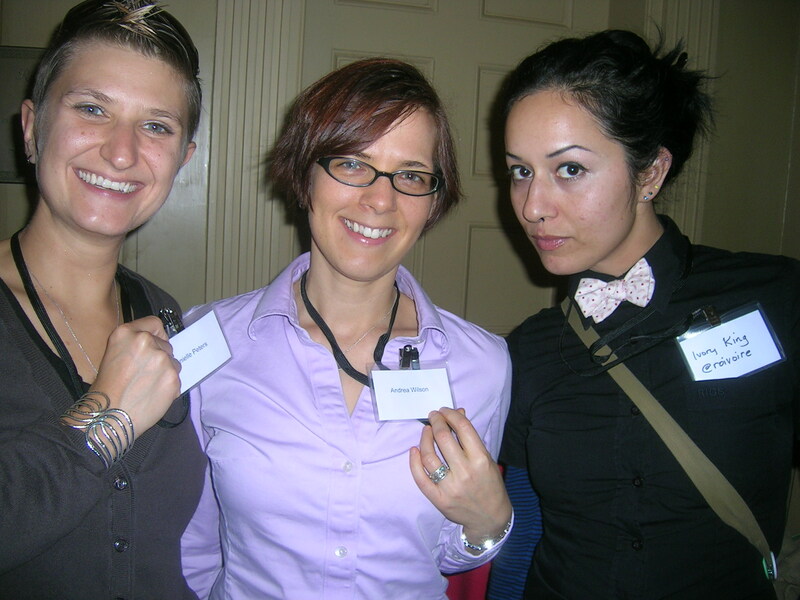 Many at the conference had worked very closely with her, including those who were active with Feminists For Animal Rights (FAR), a group Marti created based on her vision. 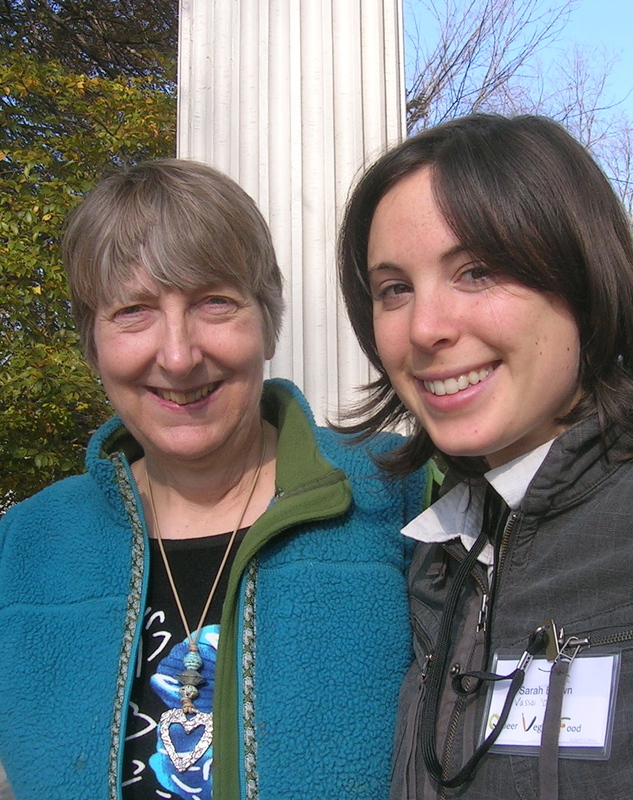 Others had volunteered with Marti for animal rights causes or had been influenced by her during their academic and activist careers. While I did not speak at the memorial, I am lucky to say that I did have the privilege of meeting Marti several years ago while I was living in the Bay Area (she was a raw vegan and we met at an Oakland raw foods event organized by a mutual connection) and we kept in touch as I worked at a raw vegan center which she had visited before we’d met. Just after meeting Marti, she instantly connected me with queer vegan women’s events she organized in the Bay Area, and we corresponded over e-mail about holistic health, and things related to a book project my partner and I were (and still are) working on about the intersections between holistic health, veganism and LGBTQ communities. 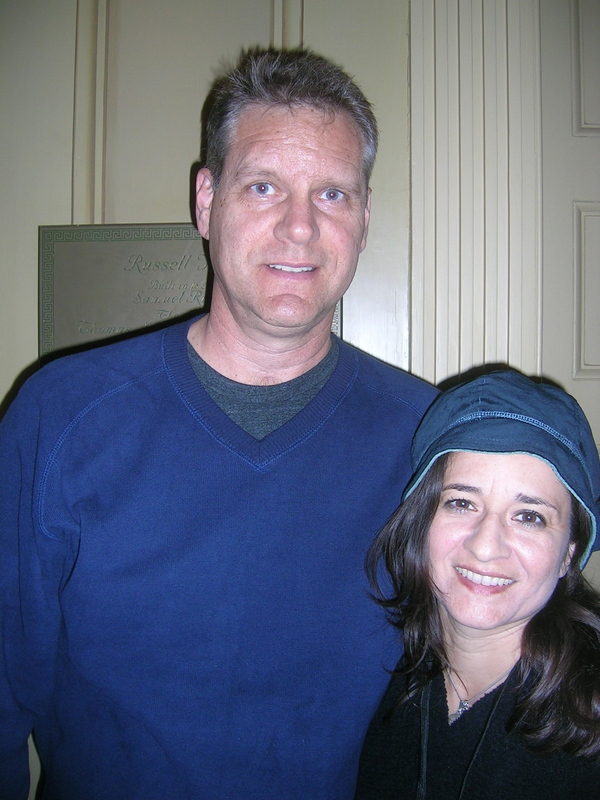 The last time I heard from Marti was on October 5, 2011 in an e-mail letting me know she was sick with cancer and that she wanted to help more with our book, and that I should e-mail her questions and ideas quickly because time was of the essence. A few weeks later, on November 19, 2011, I got news that Marti had died. While I hadn’t known Marti as well as others in attendance at the conference, and we were only beginning to discuss and collaborate on ideas, I have been so humbled and grateful that even while sick and facing the end of her life, Marti was immensely committed to helping others and advance the vegan movement. Heartwarming stories were shared at the memorial portion of the conference including a beautiful story Carol J. Adams told about how Marti began her animal activism as a young person refusing to pose in the family photos unless her family’s pet cat could be included. 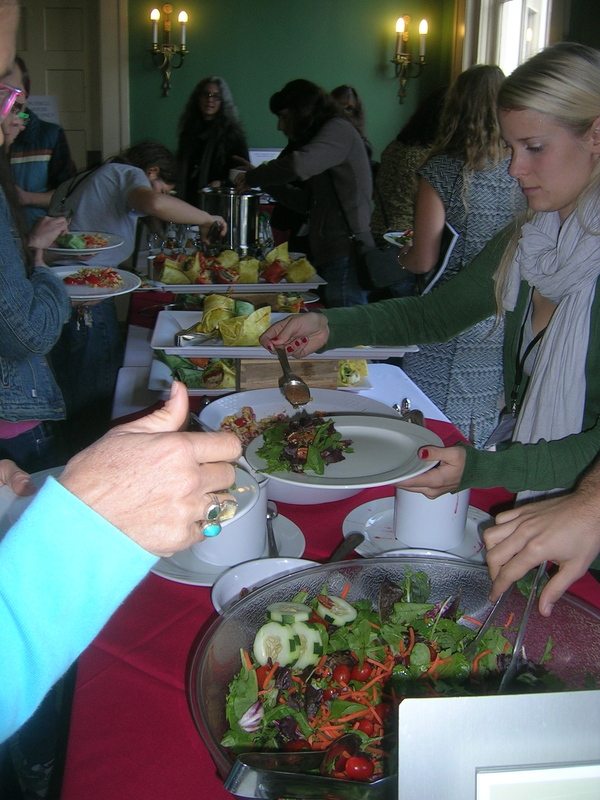 Several members of Marti’s family were in attendance, and shared how her compassionate approach to veganism influenced them and made more inspired to question aspects of their own lives. 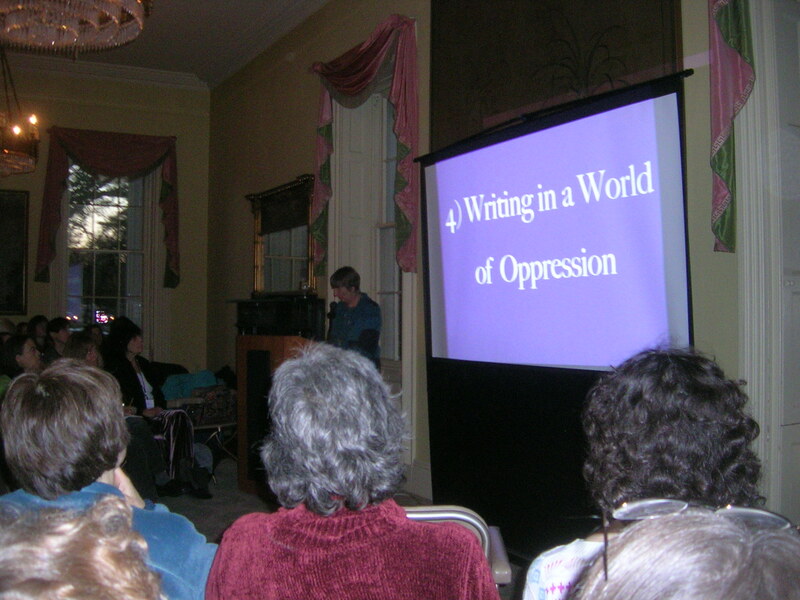 Carol J. Adams speaking at the Marti Kheel Conference. 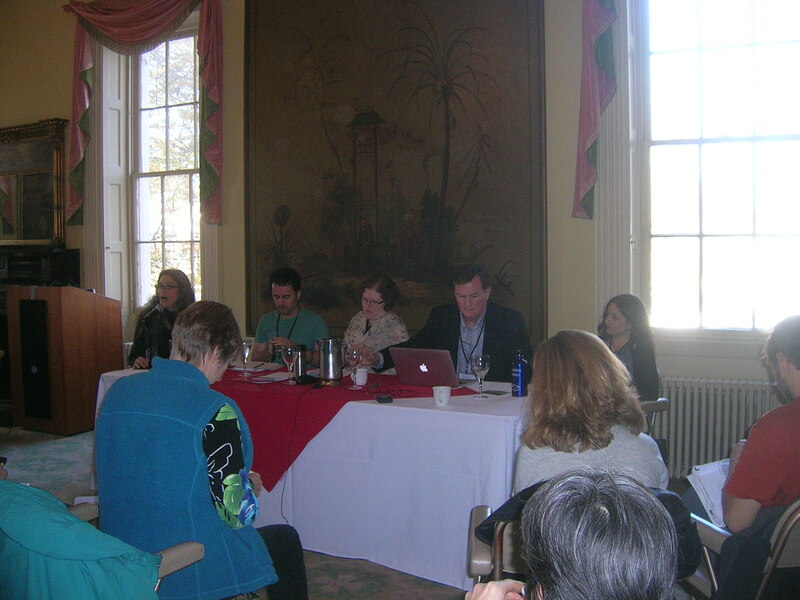 Panels at the conference referenced Marti’s Ecofeminist work and discussed how Marti’s compassionate approach to activism was infused in every aspect of her life.While the conference was primarily academic in nature–terms like “praxis” and “problemetize” were included in many panelists’ talks based on papers they’d written for the conference–there were great inclusions of practical approaches to activism that I found heartening and inspiring. My friend Lauren Ornelas of Food Empowerment Project and Silicon Valley Toxics Coalition gave a great talk about how her work with FEP considers food justice as a complex issue that requires looking beyond simply checking to see if ingredients are vegan. We must ensure that they are ethically sourced, as in the case of her nonprofit’s commitment to identifying truly ethical vegan chocolate companies that do not trade in child slave labor. (Note: Please sign the petition asking the makers of Clif Bars to disclose where they get their cocoa beans!) Lauren also discussed the importance of a vegan activist approach that is respectful to the needs of diverse communities. Absolutely inspiring, witty and brilliant vegan duo Mark Hawthorne and Lauren Ornelas. Theorist Greta Gaard spoke about ecofeminist theory and practice, and mentioned queer sexuality in the context of animal rights (which I loved). Other talks I found inspiring included pattrice jones’ discussion of her queer-run animal sanctuary Vine Sanctuary, and about how they have all of their important meetings standing up in the barn while surrounded by animals. patrice said a line which really rang true: “All the stuff we really want is free.” patrice said to share with paleo dieters and purported feminists who eat meat: “Tell them that eating meat is something you do to someone else’s body without their consent.” What a powerful and accurate thing to say! 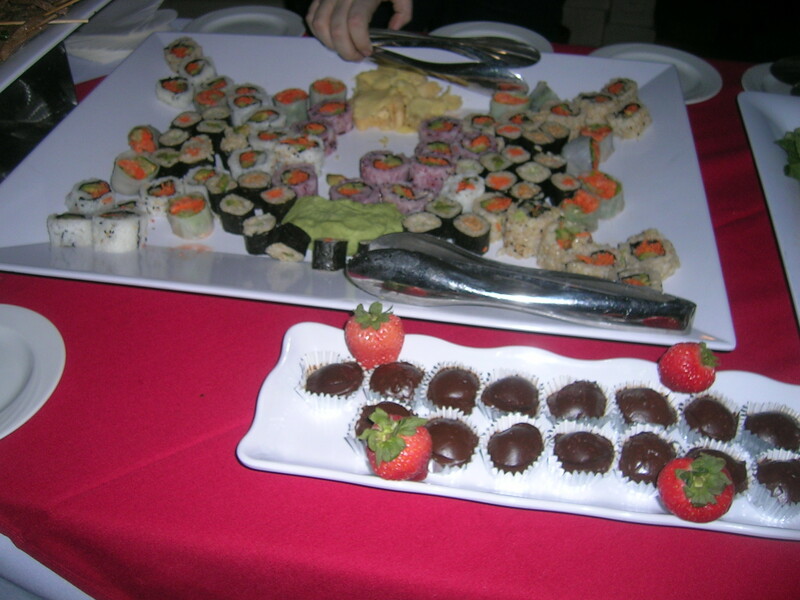 Vegan sushi and chocolates served at the Marti Kheel conference. 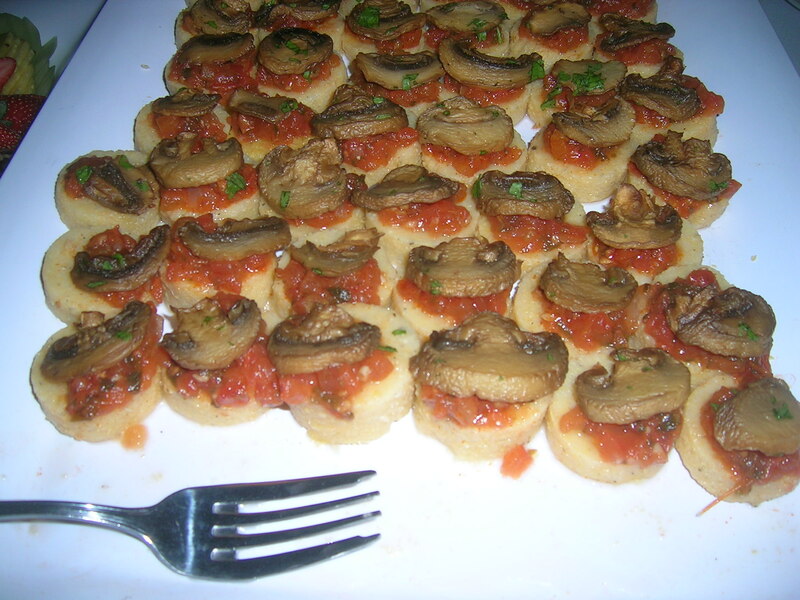 Mushroom polenta cakes served after the memorial portion of the conference. Lunch on Saturday was 100% vegan and delicious. Ivory of vegan myths debunked fame (who is an all-star, best ever vegan conference buddy, the best a gal could ever hope for!) and I met in NY Penn station (I came from Philly, she from Brooklyn) and traveled to the conference together. We had the amazing good fortune of meeting some really wonderful new friends Andrea and Danielle at the conference who convinced us to stay with them in Branford, CT (near Wesleyan) and have a late-night persimmon and almond milk Greek yogurt party instead of staying at a hotel. It did not take too much arm twisting 😉 We had a wonderful time bonding, chatting about our paths to veganism and how we all love plants (PLANTS!)! It was amazing to find some queer vegan women kinship and make incredible, thought-provoking, hilarious new friends! Vegan lady friends! L to R: Danielle, Andrea and Ivory! 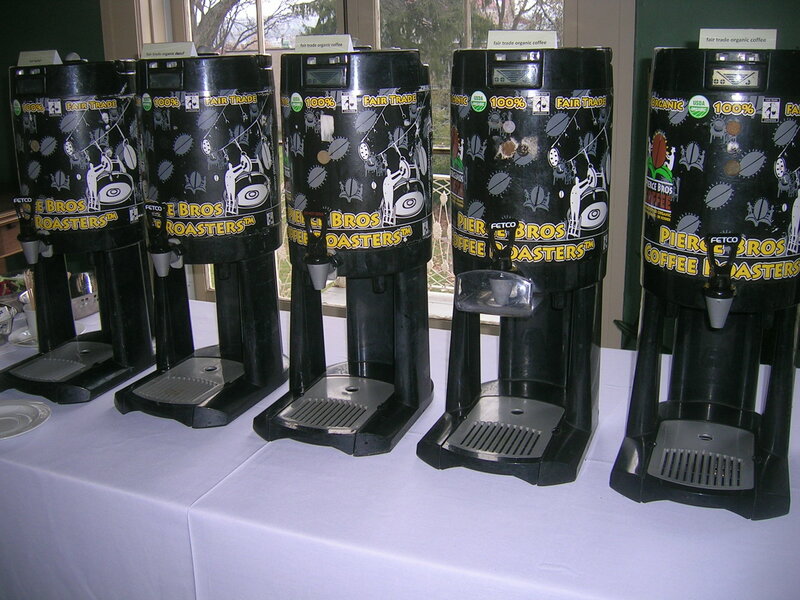 All-organic, fair-trade coffee was served with some soy mylk on the side. Ecofeminist Greta Gaard speaking about Marti Kheel. Posing after lunch with my heroine and friend Carol J. Adams. 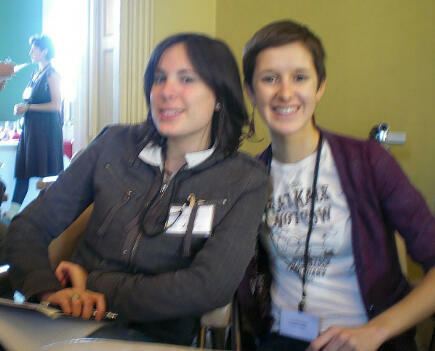 I got to meet Ali, fellow Vassar woman and author of the fabulous vegan food blog Farmers’ Market Vegan! 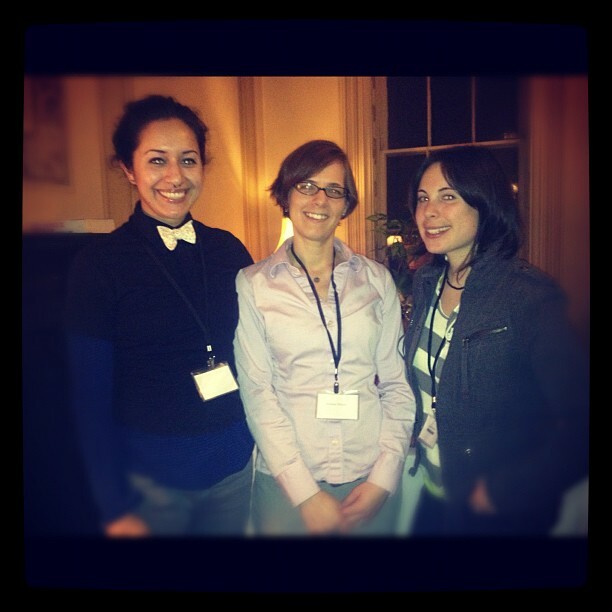 Ivory, Andrea and I had a great time at the conference! One activist spoke about her ethical dilemma in not being able to find a vegan infant formula and needing to procure one immediately for her infant in the ICU. She said the D3 in the product was sourced from lanolin, which is from sheep, and that choosing that product was very difficult for her but ultimately was what was necessary to save her son’s life. After the panel, I commended the activist for finding compassion for herself in this difficult situation, and I suggested the option of reaching out to infant formula brands that use all-vegan ingredients except for the non-vegan D3 and asking them to use vegan D3 in products now that it is available. This was something the panelist had not considered doing, and I think it’s a good example of where businesses and academics can work together to find solutions to problems. I currently work for a vegan business and have worked for other vegan businesses in the past. 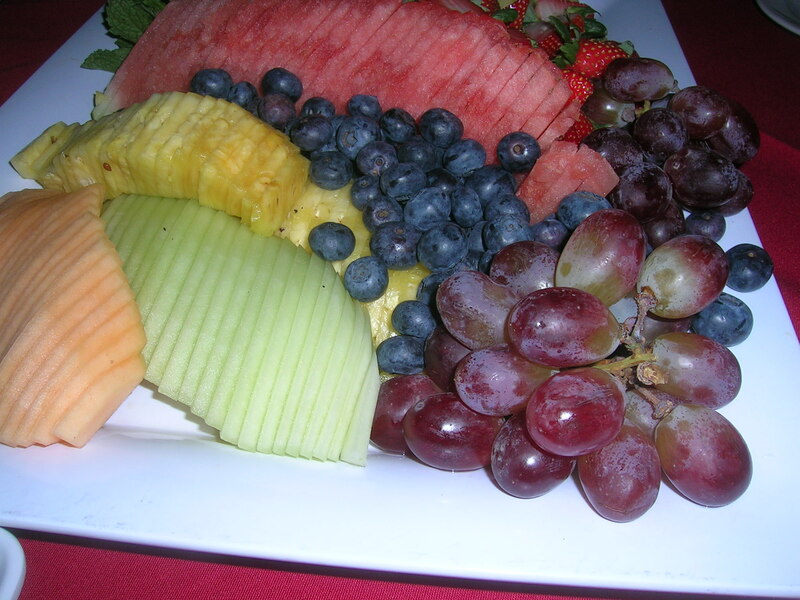 I believe in the importance of academia and the influence of scholarship in shaping ideas that later become practiced throughout activist movements, however I also feel it is crucial that we connect the dots and work with businesses to provide vegan alternatives. I think a more vegan-friendly marketplace is a great goal for academics and non-academics (lay people?) alike, and was grateful for the chance to discuss this with her. 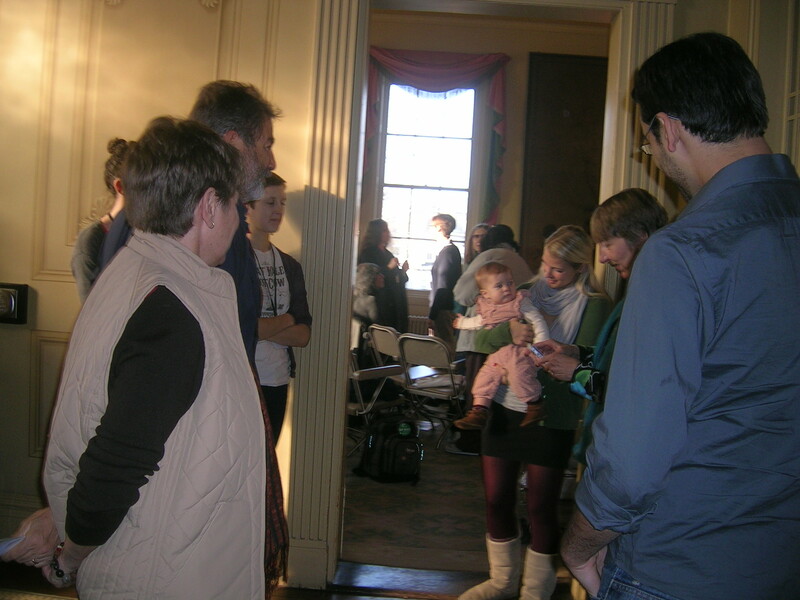 My former professor/friend Jill Schneiderman and others admiring the next generation of vegan activists. For me, Finding A Niche For All Animals involved honoring Marti Kheel and celebrating her legacy, meeting new friends, seeing old friends, connecting with visionaries and a rare and incredibly sweet private lunch with Carol and Ivory in which we discussed our work and plans for the future. I leave with a renewed inspiration that vegan activism must always come from the love and empathy we have inside us that extends outwards to those around us. Thank you for reading.